This new take on a familiar supplement has been getting a lot of attention. But is it all its fans say? Here's where the science is right now. HMB, or beta-Hydroxy beta-methylbutyrate, has earned a lot of attention in recent years for its reputation to improve recovery, increase muscle protein synthesis, and decrease muscle protein breakdown. It's been a popular supplement for most of the last decade for these reasons, but for most of that time, there was only one type of HMB: HMB-Ca, which came in the form of a calcium salt. In recent years, a new version, HMB-FA or "free acid" has been promising even greater results. So, what does the science say? Let's investigate. HMB has been shown in studies to stimulate muscle protein synthesis by sparking an increase in anabolic signaling through the mTOR pathway, and inhibit muscle protein breakdown by blunting catabolic signaling within the ubiquitin-proteasome pathway. Evidence also suggests that HMB promotes other benefits, such as reducing markers of muscle damage, which may enhance recovery from high-intensity workouts. HMB is a metabolite of the amino acid leucine, meaning that when we eat protein, a small percentage gets converted to HMB. However, you would need to consume 60 grams of leucine, or up to 750 grams of high-quality protein per day, to obtain an effective dose of HMB (3 grams per day) through your diet. Therefore, taking a supplemental form of HMB is ideal. However, other placebo-controlled research has shown no additional benefits of HMB-Ca supplementation when combined with a resistance training program. [7, 14] Nevertheless, HMB has become an appealing nutritional supplement for athletes participating in high-intensity, muscle-damaging exercise, due to its anabolic and anticatabolic effects. How is HMB free acid different than HMB-Ca? Recently, HMB free acid (HMB-FA) has been publicized as the superior form of HMB. Here's the reasoning: HMB-Ca generally has a slow rate of appearance in the bloodstream after ingestion, taking approximately 60-120 minutes to reach peak concentrations in the blood. On the other hand, when HMB is provided in its free acid form, the absorption rate is accelerated, resulting in peak HMB concentrations in the bloodstream approximately 30 minutes after ingestion. [5, 6, 7] Not only does HMB-FA appear more rapidly in the bloodstream compared to HMB-Ca, it also yields greater peak HMB concentrations. Lastly, an increased clearance rate was also observed with HMB-FA, presumably as a result of better uptake by the muscle. All in all, the greater absorption rate, peak concentrations, and clearance rate are claimed to result in greater intramuscular HMB bioavailability. Thus, HMB-FA may theoretically provide a superior stimulus for exercise recovery compared to HMB-Ca. Is there a physique or performance application? First and foremost, very few studies have directly compared the effects of HMB free acid versus HMB-Ca, making it difficult to determine if HMB-FA is truly a superior form of HMB. A recent study investigating the impact of HMB-Ca on muscle metabolism concluded that, despite the proposed differences in bioavailability, HMB-Ca provides a comparable anabolic and anti-catabolic effect compared to HMB-FA. When HMB-FA is provided around a single bout of resistance exercise, supplementation appears to reduce markers of muscle damage along with boosting immune and hormonal responses. Whether this translates to improved muscular adaptations over time isn't clear, though. Few studies have investigated the chronic effects of HMB-FA supplementation during a resistance training program. A recent series of publications have suggested that supplementation with HMB-FA (3 grams per day) results in increased lean body mass, muscle hypertrophy, strength, and power in resistance-trained men. [11, 12] However, the anabolic drug-like gains in strength and size in these studies have raised skepticism and debate. [13, 14, 15] In these studies, the HMB-FA supplemented groups put on approximately 18 pounds of lean body mass (13 pounds more than the placebo group) during the eight-week intervention period. One follow-up study, however, also showed that HMB-FA supplementation during a six-week resistance training program induced greater gains in strength (1RM leg press) and vertical jump power in comparison to a placebo-supplemented group. Additionally, HMB-FA supplementation may also increase growth hormone and insulin-like growth factor 1 (IGF-1), while blunting the catabolic hormone cortisol. [16, 17] HMB-FA has demonstrated anabolic and anti-catabolic properties that may promote muscular adaptations, but it's most likely unrealistic to take it expecting to gain double-digits of lean mass in just a few weeks. HMB-FA has also been studied alongside high-intensity interval training (HIIT). A series of publications have investigated the effect of HMB-FA on aerobic capacity (i.e., VO2 peak), time to exhaustion, and physical working capacity during a four-week cycling HIIT program. [18, 19] Interestingly, HMB-FA supplementation significantly improved aerobic capacity and physical working capacity compared to a placebo group. However, no differences were observed for time to exhaustion. Overall, when combined with HIIT, HMB-FA supplementation may further improve markers of aerobic fitness. The authors speculate that HMB-FA supplementation may have enhanced the effects of HIIT by improving recovery between exercise sessions or improving metabolism via increased mitochondrial biogenesis and/or fat oxidation. However, more research is needed to support these proposed mechanisms. But, how does HMB-FA stack up against HMB-Ca? A recent study investigated muscular adaptations following an 8-week resistance training program when supplementing with either HMB-Ca, HMB-FA, or a placebo. Although all groups increased muscle size, strength, and power, there was no added benefit of either HMB supplement. These authors concluded that HMB-FA and HMB-Ca supplementation failed to further improve muscle growth and strength development in young men. What's the bottom line right now? When combined with resistance training, HMB free acid supplementation may lessen markers of muscle damage, augment immune and hormone responses, and enhance training-induced muscle mass and strength. HMB-FA supplementation may also improve markers of aerobic fitness when combined with HIIT training. Those are all compelling reasons to try it. Nevertheless, more studies are needed to determine the overall effectiveness of HMB-FA supplementation as a nutritional supplement. Currently, it cannot unequivocally be stated that HMB-FA supplementation would prove to be as beneficial to athletes as eating adequate high-protein foods and boosting total protein intake to greater than 1.8 grams of protein per kilogram of body weight. In fact, HMB added to whey protein did not result in greater increases in muscle size or strength compared to leucine added to whey, raising the possibility that HMB may be no more effective at stimulating muscular adaptations than simply getting more of dietary sources of high-quality, leucine-rich protein. That said, situations whereby HMB-FA supplementation may theoretically prove useful include periods of caloric restriction or dieting, rehabilitation from injury, periods of extreme inactivity, or long, sustained exercise such as military missions. While conflicting results have been reported regarding the muscle-building effects of HMB supplementation in well-trained subjects, it should theoretically be most beneficial during prolonged periods of high-intensity, high-volume, muscle-damaging resistance training, or what is often known as "over reaching." The program I laid out in my article The New Science of Size and Strength wouldn't be a bad place to start. 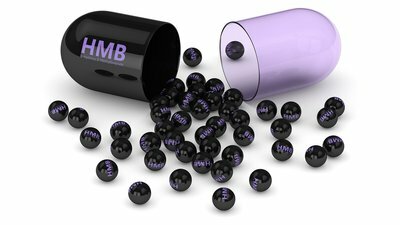 The recommended dose of HMB free acid is 3 grams per day, with no further benefits being observed at higher 6-gram doses. The optimal dosing pattern is not yet clear; however, most studies provide a 1 gram serving of HMB-FA 30 minutes before hitting the gym, with the remaining 2 servings being consumed with meals throughout the day. No adverse effects have been associated with HMB-FA supplementation, therefore the potential benefits do outweigh the risks. Nevertheless, more studies are needed to determine if this supplement will truly supercharge your gains. The Clear Pill That Helps Build Lean Muscle. Wilson, J. M., Fitschen, P. J., Campbell, B., Wilson, G. J., Zanchi, N., Taylor, L., ... & Ziegenfuss, T. N. (2013). International Society of Sports Nutrition position stand: beta-hydroxy-beta-methylbutyrate (HMB). Journal of the International Society of Sports Nutrition, 10(1), 6. Gallagher, P. M., Carrithers, J. A., Godard, M. P., Schulze, K. E., & Trappe, S. W. (2000). beta-hydroxy-beta-methylbutyrate ingestion, part I: Effects on strength and fat free mass. Medicine & Science in Sports & Exercise, 32(12), 2109-2115. Jówko, E., Ostaszewski, P., Jank, M., Sacharuk, J., Zieniewicz, A., Wilczak, J., & Nissen, S. (2001). Creatine and beta-hydroxy-beta-methylbutyrate (HMB) additively increase lean body mass and muscle strength during a weight-training program. Nutrition, 17(7-8), 558-566. Panton, L. B., Rathmacher, J. A., Baier, S., & Nissen, S. (2000). Nutritional supplementation of the leucine metabolite beta-hydroxy-beta-methylbutyrate (hmb) during resistance training1. Nutrition, 16(9), 734-739. Fuller, J. C., Sharp, R. L., Angus, H. F., Baier, S. M., & Rathmacher, J. A. (2011). Free acid gel form of beta-hydroxy-beta-methylbutyrate (HMB) improves HMB clearance from plasma in human subjects compared with the calcium HMB salt. British Journal of Nutrition, 105(3), 367-372. Gonzalez, A. M., Stout, J. R., Jajtner, A. R., Townsend, J. R., Wells, A. J., Beyer, K. S., ... & Bohner, J. D. (2014). Effects of beta-hydroxy-beta-methylbutyrate free acid and cold water immersion on post-exercise markers of muscle damage. Amino Acids, 46(6), 1501-1511. Wilkinson, D. J., Hossain, T., Hill, D. S., Phillips, B. E., Crossland, H., Williams, J., ... & Etheridge, T. (2013). Effects of leucine and its metabolite beta‐hydroxy‐beta‐methylbutyrate on human skeletal muscle protein metabolism. The Journal of Physiology, 591(11), 2911-2923. Fuller, J. C., Sharp, R. L., Angus, H. F., Khoo, P. Y., & Rathmacher, J. A. (2015). Comparison of availability and plasma clearance rates of beta-hydroxy-beta-methylbutyrate delivery in the free acid and calcium salt forms. British Journal of Nutrition, 114(9), 1403-1409. Silva, V. R., Belozo, F. L., Micheletti, T. O., Conrado, M., Stout, J. R., Pimentel, G. D., & Gonzalez, A. M. (2017). beta-Hydroxy-beta-methylbutyrate free acid supplementation may improve recovery and muscle adaptations after resistance training: A systematic review. Nutrition Research, 45, 1-9. Wilkinson, D. J., Hossain, T., Limb, M. C., Phillips, B. E., Lund, J., Williams, J. P., ... & Rathmacher, J. A. (2017). Impact of the calcium form of β-hydroxy-β-methylbutyrate upon human skeletal muscle protein metabolism. Clinical Nutrition. Lowery, R. P., Joy, J. M., Rathmacher, J. A., Baier, S. M., Fuller, J. C., Shelley, M. C., ... & Wilson, J. M. (2016). Interaction of beta-hydroxy-beta-methylbutyrate free acid and adenosine triphosphate on muscle mass, strength, and power in resistance trained individuals. Journal of Strength and Conditioning Research, 30(7), 1843-1854. Wilson, J. M., Lowery, R. P., Joy, J. M., Andersen, J. C., Wilson, S. M., Stout, J. R., ... & Rathmacher, J. (2014). The effects of 12 weeks of beta-hydroxy-beta-methylbutyrate free acid supplementation on muscle mass, strength, and power in resistance-trained individuals: a randomized, double-blind, placebo-controlled study. European Journal of Applied Physiology, 114(6), 1217-1227. Gentles, J. A., & Phillips, S. M. (2017). Discrepancies in publications related to HMB-FA and ATP supplementation. Nutrition & Metabolism, 14(1), 42. Hyde, P. N., Kendall, K. L., & LaFountain, R. A. (2016). Interaction of Beta-Hydroxy-Beta-Methylbutyrate Free Acid and Adenosine Triphosphate on Muscle Mass, Strength, and Power in Resistance-Trained Individuals. The Journal of Strength & Conditioning Research, 30(10), e10-e11. Phillips, S. M., Aragon, A. A., Arciero, P. J., Arent, S. M., Close, G. L., Hamilton, D. L., ... & Ormsbee, M. J. (2017). Changes in Body Composition and Performance With Supplemental HMB‐FA+ ATP. The Journal of Strength & Conditioning Research, 31(5), e71-e72. Asadi, A., Arazi, H., & Suzuki, K. (2017). Effects of beta-hydroxy-beta-methylbutyrate-free acid supplementation on strength, power and hormonal adaptations following resistance training. Nutrients, 9(12), 1316. Tinsley, G. M., Givan, A. H., Graybeal, A. J., Villarreal, M. I., & Cross, A. G. (2018). Beta-Hydroxy beta-methylbutyrate free acid alters cortisol responses, but not myofibrillar proteolysis, during a 24-h fast. British Journal of Nutrition, 119(5), 517-526. Miramonti, A. A., Stout, J. R., Fukuda, D. H., Robinson IV, E. H., Wang, R., La Monica, M. B., & Hoffman, J. R. (2016). Effects of 4 weeks of high-intensity interval training and beta-Hydroxy-beta-Methylbutyric free acid supplementation on the onset of neuromuscular fatigue. The Journal of Strength & Conditioning Research, 30(3), 626-634. Robinson, E. H., Stout, J. R., Miramonti, A. A., Fukuda, D. H., Wang, R., Townsend, J. R., ... & Hoffman, J. R. (2014). High-intensity interval training and beta-hydroxy-beat-methylbutyric free acid improves aerobic power and metabolic thresholds. Journal of the International Society of Sports Nutrition, 11(1), 16. Teixeira, F.J., Matias, C.N., Monteiro, C.P., Valamatos, M.J., Reis, J., Tavares, F., Batista, A., Domingos, C., Alves, F., Sardinha, L.B. & Phillips, S.M. (2018). Leucine Metabolites Do Not Enhance Training-induced Performance or Muscle Thickness. Medicine and Science in Sports and Exercise. Jakubowski, J.S., Wong, E.P., Nunes, E.A., Noguchi, K.S., Vandeweerd, J.K., Murphy, K.T., Morton, R.W., McGlory, C. & Phillips, S.M. (2018). Equivalent Hypertrophy and Strength Gains in HMB-or Leucine-supplemented Men. Medicine and Science in Sports and Exercise. Adam M. Gonzales, PhD has published over 90 peer-reviewed research articles and abstracts on applied exercise physiology and sports nutrition.